After driving a Reva-i around Kathmandu for six years, I had hardly any complaints about the little bugs. Yes, people made fun of the electric vehicle (EV), children would point at me from the back of school buses and laugh, impatient motorcyclists would overtake from the left and right simultaneously. My ego could handle all that. But there were two negative points: it was cramped, and the car gave you endurance anxiety every time the a/c reduced the range. 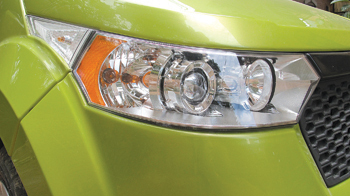 Reva Mahindra’s new e2o (energy to oxygen) has solved those two problems and has brought a futuristic car to the Nepal market that is no longer just a golf cart. This next-generation EV, with bells and whistles, offers a whole new concept in green private mobility. The dimensions are nearly that of a Wagon R (although it is a two-door) and the range is extended to 100km thanks to the environmentally-friendlier lithium-ion batteries instead of lead cells. Everything about this EV feels different from the Reva-i: the smooth ride, the glass cockpit, automatic windows, and the ability to control charging, a/c or to lock doors remotely via iPhone. The designers have given as much thought to mobility as they have to connectivity and inserted a SIM card to help it communicate with its makers in Bangalore in real time. Any malfunction and the controllers will notify you via SMS while you are stuck in traffic at Baneswor. 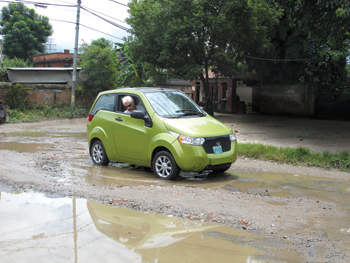 Not everyone will immediately take to the e2o: it is lanky, narrow, and looks like a gnu from the front. The front grille is needlessly oversized, the windows are smallish and restrict all-round visibility from the cabin. The tiny rear windows, for some reason, don’t open. It sits high on the road since the driver’s seat is on top of the batteries, so from the inside it actually feels like an Ignis or Terios. But the rear end is well-proportioned and the car’s silhouette ultimately grows on you. The skin is dent proof (since it’s not metal) and is scratch proof because the colour is impregnated into the plastic mould. Inside, it is spacious even in the back with plenty of leg and head room to spare. This is a great improvement on the Reva, but the cabin doesn’t compare in comfort and finishing with other similar-sized Korean or Indian hatchbacks. 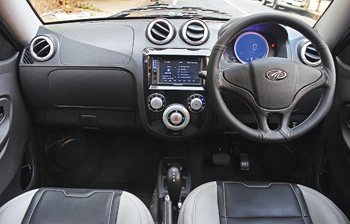 The large diameter steering gives the controls a light touch even over potholes on the city's rough roads. The transmission knob of the Reva-i has been moved to make it look like an automatic gear shift although, of course, the car doesn’t have a gear box. The B for Boost option has the familiar torque kick while overtaking. The dashboard is made of state-of-the-art touchscreen display that controls the audio, the energy management system, and even a very handy reversing camera to allow you to make a quick U-turn on a narrow lane. Unlike the Reva’s analogue displays, the e2o has a backlit speed dial that also gives you the charge and km left on the battery. Another difference is the keyless dongle to open doors and even to authenticate the start press. Which brings me to the minus points. What if the battery runs out on the dongle and you can’t open the car? Wonder if it is wise to be so over-electronified in a vehicle in Nepal. The touchscreen display is a bit distracting in the beginning (memo to self: keep eyes on the road). The display can also be affected by ambient glare that makes it hard to see. With a lithium-ion battery, one would expect a greater range and a shorter charge time, but it is a huge improvement on the Reva-i, so I am not complaining too much. All this is more than compensated for by the zero emission and the fuel efficiency of the e2o. It may not make much sense to have an electric car in India where 70 per cent of grid electricity is generated from coal-fired plants, but in Nepal we are mostly hydro. Even in the worst load-shedding winter days, you need just five hours of charging every four days or so, and that gives you up to 100km without a/c. If you average 10,000km a year in a 1.0 litre petrol hatchback, you are probably burning 1,000 litres of fuel which will set you back more than Rs 120,000 a year. 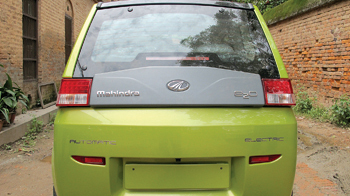 At Rs 80 per 100km, the e2o’s electric bill would come to about Rs 8,000 a year. However, add the cost of the lithium batteries which have to be replaced in five years fort Rs 300,000, although by 2018 the price of lithium may come down, and the price of petrol is only going to rise. So, all in all, the e2o still saves you money in the long-term. But more importantly, you will also sleep more soundly at night. The governments failure to enforce justice is rapidly eroding its grip and may be contributing to Nepal becoming a failed state.